The collect and readings for today, the Second Sunday after Christmas, may be found here. The gospel appointed for today is Matthew 2:13-15, 19-23. I included the omitted section, verses 16-18. “Get up, take the child and his mother, and flee to Egypt, and remain there until I tell you.” So ends Matthew’s version of the Christmas story. The savior, it seems, needs to be saved and God turns to humanity, specifically Joseph. With the incarnation God not only becomes human but entrusts God’s self to the care of humanity. Everything about Matthew’s Christmas story has the harsh reality of today’s headlines – an unwed mother, a tyrant ruler, refugees, violence and death. Matthew offers no cause for Christmas sentimentality. There are no angel choirs and heavenly lights, no shepherds, and no manger where the little Lord Jesus lay down his sweet head. According to Matthew Mary is pregnant, unmarried but betrothed to Joseph. Joseph has a dream and an angel tells him to take Mary as his wife. He obeys. The child is born. He is named Jesus. The wise men have visited and returned to their own country. And now King Herod is royally ticked off; infuriated that he has been tricked by the wise men. Fearful of this newborn King of the Jews he murders all the baby boys who were two years old or under. 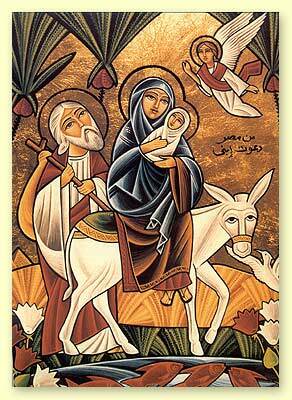 The Holy Family, now the Holy Refugees, flees to Egypt. Matthew’s Christmas story is set in a world of violence, filled with power, fear, death, oppression, wailing and loud lamentation, one in which innocence is slaughtered, and survival means life on the run. And yet there is something reassuring and comforting about this setting. For if that is not the world into which the savior is born of what relevance is he to our world? To our lives? The headlines of our day are not that different from the headlines of Jesus’ day – violence and death, weeping, tyrants. At a more personal level each one of could probably name the Herods of our lives and tell a story of fear, oppression, violence, death, running for our life, the loss of innocence, sorrow and weeping. This is our world and it is our world into which Jesus is born. It is our world in which Jesus will save his people. It is our world in which Jesus will reveal that God is with us. It is not enough, however, for us to simply celebrate Christmas as the birth of the savior and then get back to life as usual as if Christmas is over. If we stand at the manger adoring the new born savior only to walk away and celebrate the New Year, pay the Christmas credit card bills, return to work and school, and prepare our taxes I assure you we will read the same old headlines over and over and over again. Whether we call it Herod, Archelaus, fear, poverty, war, hunger, injustice, violence, addiction, despair, sorrow, death, indifference, or any one of a thousand other names there is always a tyrant that seeks to destroy the divine life, a tyrant that wants to kill the holiness in this world, a tyrant that proclaims itself as ruler and denies God is with us. The salvation Christ brings is not simply an exhibition of what God can do. We cannot just stand by as spectators waiting and watching. We are called to participate and cooperate with God in our own salvation by our faithfulness, in our life of prayer, by listening, and obedience. We cooperate with God’s salvation through acts of compassion, caring for the poor, speaking for justice on behalf of those who have no voice, offering mercy and forgiveness. We participate in our own salvation each time we repent and seek reconciliation with God and our neighbor. Sometimes it means we live in hope when everything around us makes us want to despair. God entrusted the divine life of his son to Joseph. That is what Joseph’s dreams are all about – taking Mary as his wife, fleeing to Egypt, returning to the land of Israel, going away to the district of Galilee. Every one of his dreams is about protecting the holy from the Herods of this world. Whether he knew it or not, in taking the child and his mother and fleeing to Egypt, Joseph was participating in his own salvation. Every one of us has been entrusted with divine life. That is the reality of Christmas. We find it wherever we go. It is in our families, our marriages, our work, the strangers we encounter, the enemies we avoid, the oppressed and marginalized. Divine life, the presence of God, is everywhere waiting for us. That divine life, like a young child, needs to be cared for, nurtured, loved, protected, and fed in order that it might grow into its intended fullness. That is our Christmas work. As this Christmas season comes to an end and decorations are packed away, the lights taken down, the leftovers thrown out, and life returns to “normal” I wonder, how will we care for the gift of holiness, God’s presence in the world, in each other, in ourselves. Will we make the trip to Egypt? First-rate work. You have made a new devotee. Please maintain the good work and I look forward to more of your engrossing writings.